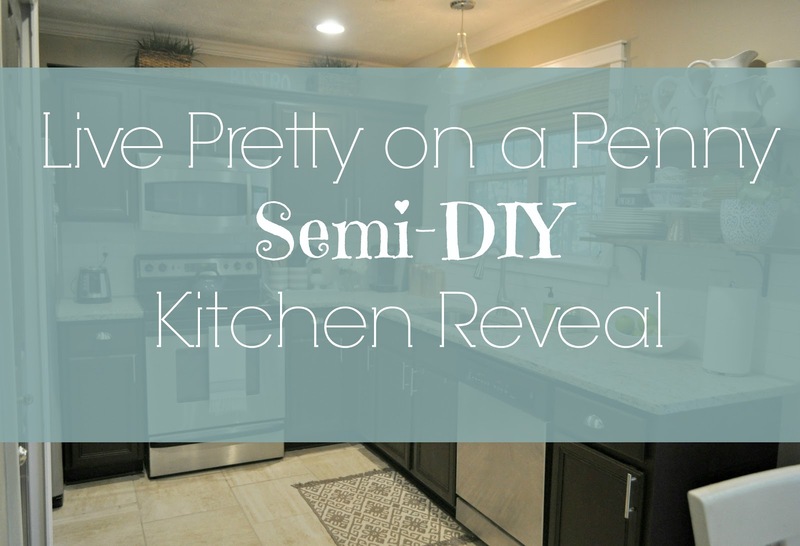 Live Pretty on a Penny Semi- DIY Kitchen Reveal! Hey guys and happy Thursday! We are so close to the end of the week and I am super hype about it. I am looking forward to a nice relaxing weekend at home. 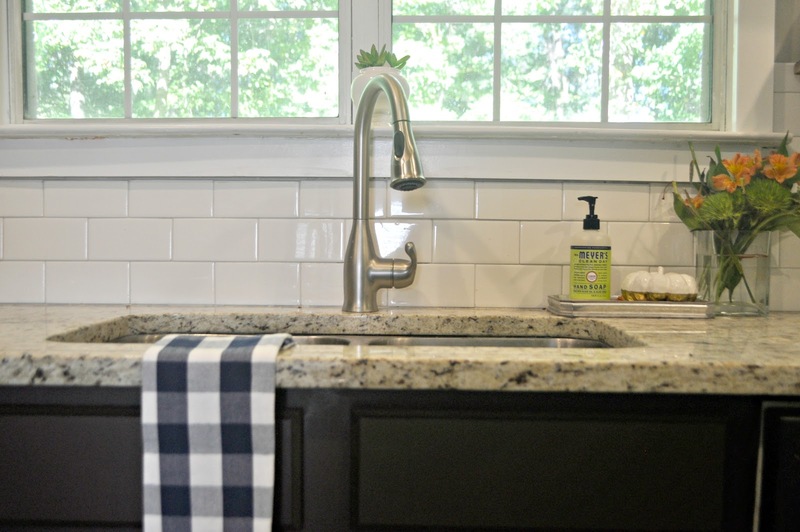 I am also looking forward to finally revealing my kitchen makeover to you today. I am both excited and nervous. Especially because I feel like I have built to much hype around it on Instagram, then as I was snapping pics, I was like…wait…it’s not many pics to snap because the space isn’t that big, lol. Anywho, let’s take a look back at where we started. I mean all the way back to the real estate listing. Fast forward to 2012, we decided to paint the cabinets and had some ceramic tile installed. I knew we weren’t in a financial position to change out the countertop, so we decided to work around what we had. Using the Rust-Oleum Cabinet Transformations kit, we painted the cabinets Kona. We also changed the flooring to a neutral ceramic tile. It was a nice change for the time being, but I wasn’t 100% sold on it. So fast forward to this year, where you may remember this story, we had to get the kitchen tile pulled up due to water damage in the wall behind the dining room. Well, I felt it was perfect timing to look at changing out the counter as well, since I knew that I was not going to select a new floor based on my current counter and backsplash. I had grown to strongly dislike both. 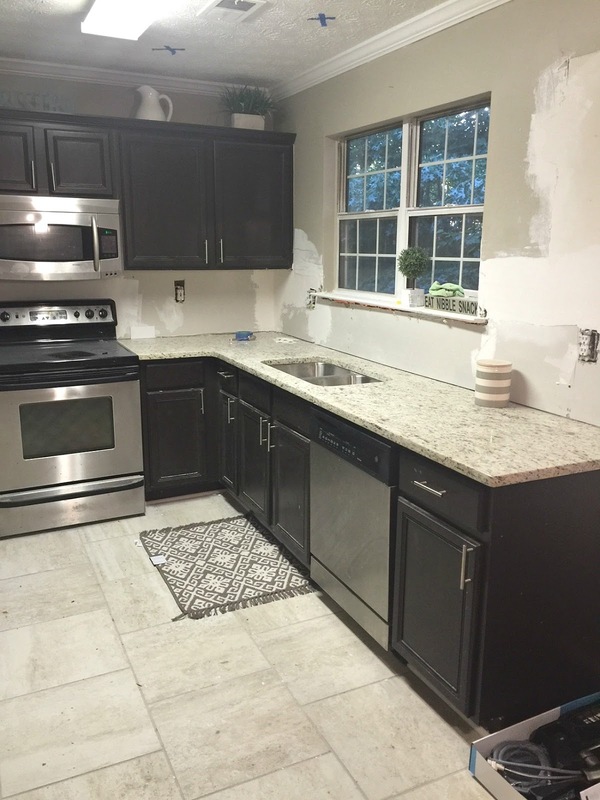 So this past Spring, I put together a plan of action to give a kitchen a facelift. It started with my new countertop and I selected my new floors based off of that counter. We also pulled off the old backsplash, removed the hideous florescent box light, and as you can see pulled down that random cabinet from the picture above. We did not install the kitchen counter or the floors. Since they were repairing the floor in entire main level, my contractors installed both, but we did everything else. In place of that awkward cabinet, we opted for two wood shelves that I made. You can see the tutorial and reveal here. They add a great place for styling, yet are very functional and provide storage and a touch of pretty. 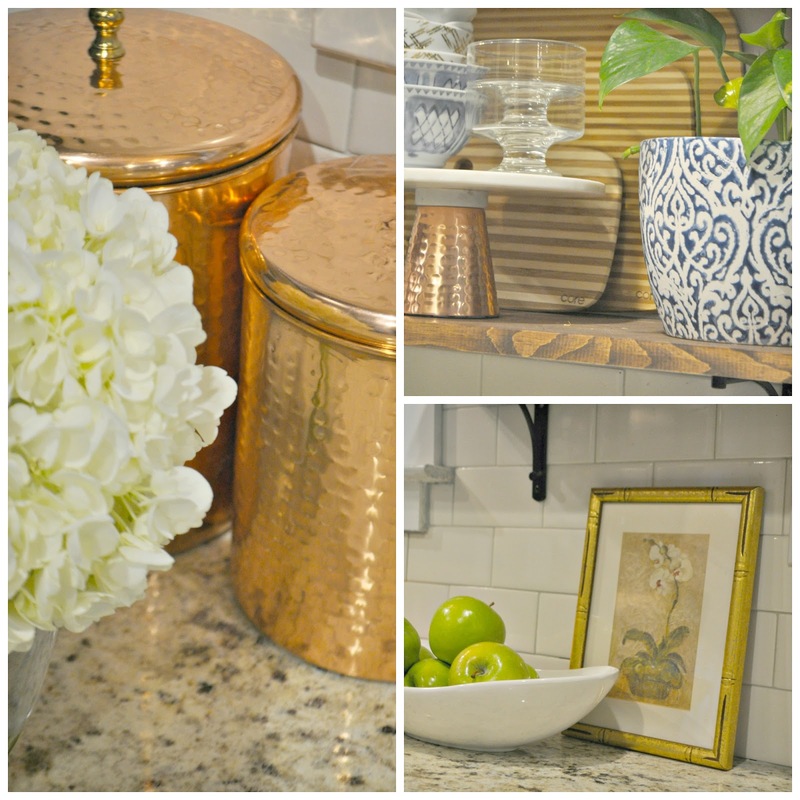 I have never been one to stick with one metal in the house, so I knew the kitchen needed copper. I added these two copper storage containers which hold our coffee k-cups and tea. 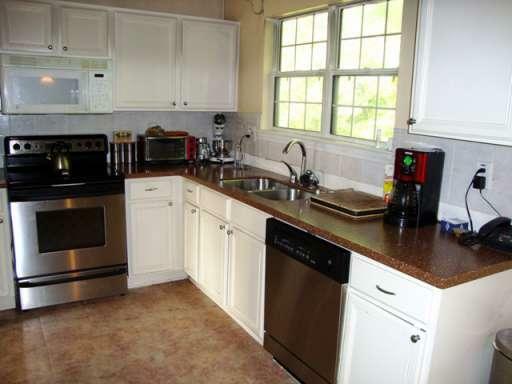 I love that while the kitchen is not big, its super functional and everything has a place. It’s so cute and makes me happy. 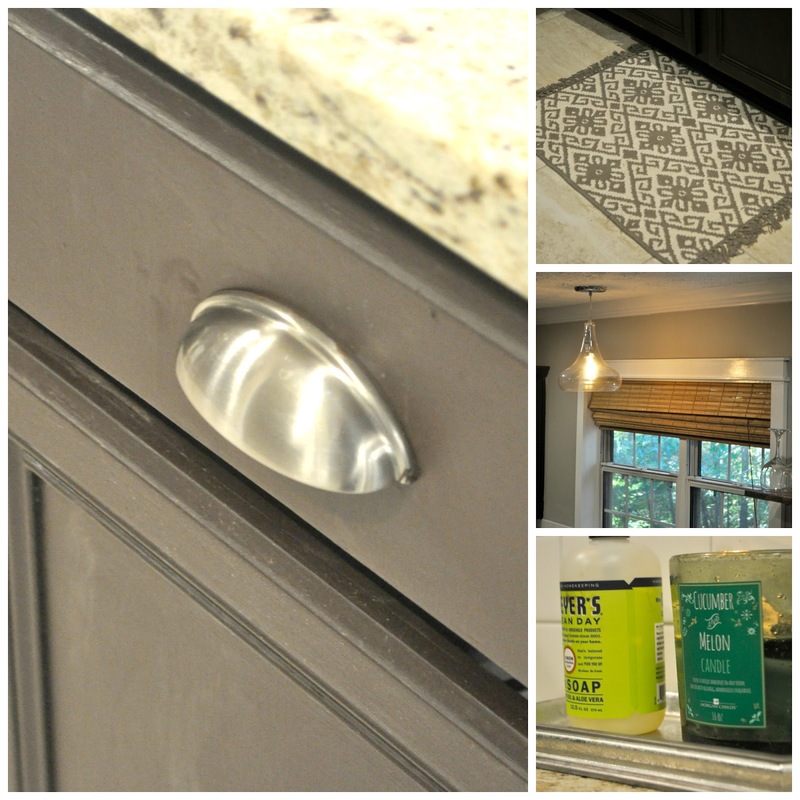 I opted to mix of the knobs and added these cup pulls along with the sleeker style handles. I like the way it looks. I love the patterned rug, pendant light and bamboo shades. I think they are great additions tie into each other perfectly. We also LOVE our new faucet. Love Love Love it! 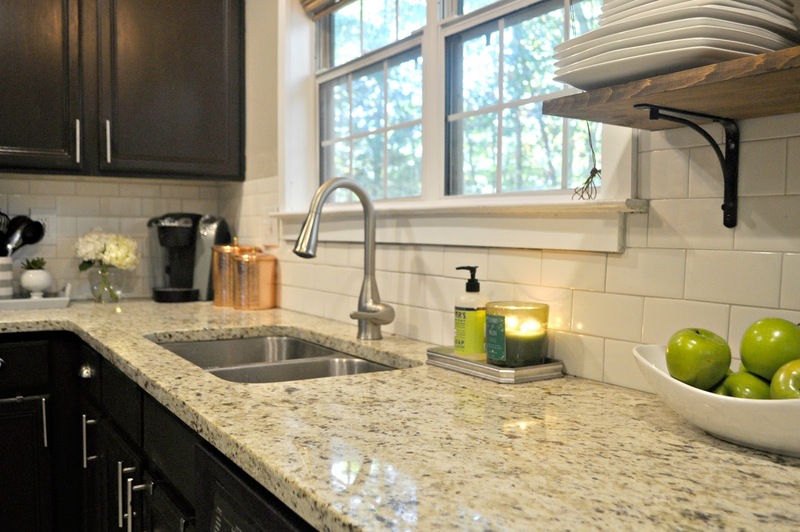 The subway tile as backsplash was also definitely the way to go! See how I installed it myself here. So that’s it! What do you think? 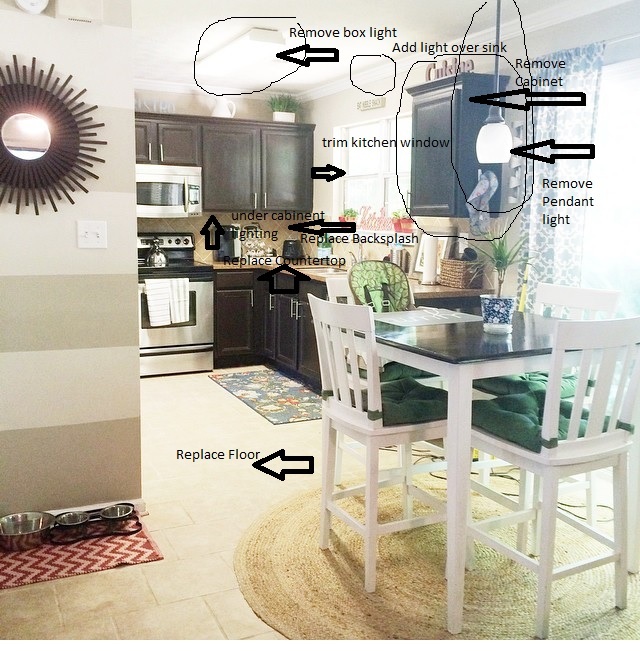 I still have a couple things that I need to do as far as organizing the kitchen pantry and under the cabinets, finding some under cabinet lighting, and picking out a new light for over the kitchen table. But other than that, you can call this project done! If you have any questions about anything in the kitchen, or about its updates, please let me know. See all of my past kitchen posts here, here, and here. Erin this is absolutely beautiful! I love the backsplash and the faucet. Who knew one could love a faucet so much! Great job with everything here, I'm pinning for future reference! Thanks Alaya! I love the faucet too. I never knew a faucet could make me so happy! Erin it looks amazing! This space is BEAUTIFUL! You did an amazing job, the space looks so bright and light. I love it! Thank you! 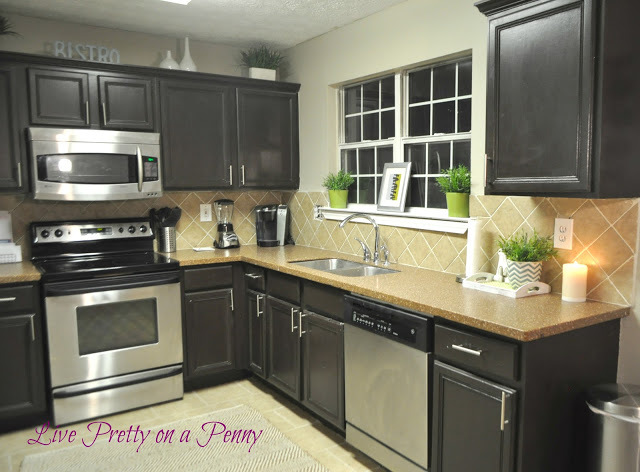 I love that even though the cabinetry is dark, it still definitely has brightened up a lot! Thanks for stopping by. 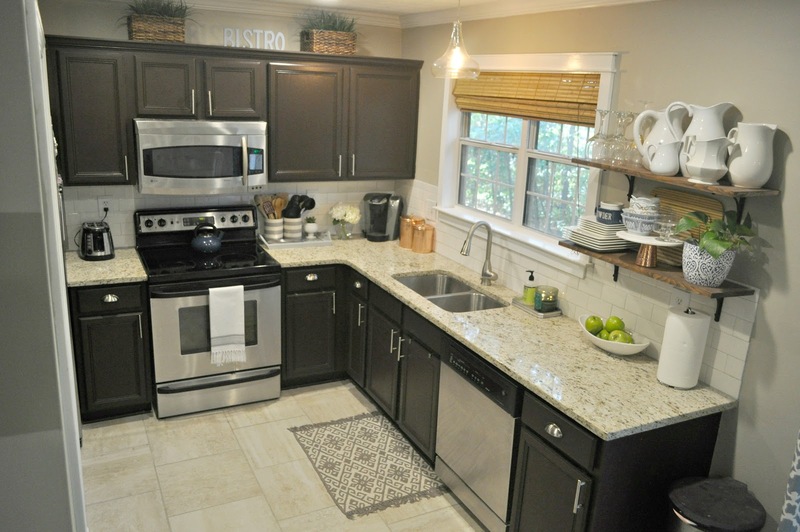 Very nice I love the transformation, the open shelving, the counter tops and lovely granite are very nice touches. Great job! Thanks Natashia! I really appreciate you stopping by and leaving such a nice comment. Happy Thanksgiving. Erin it's gorgeous!!!! 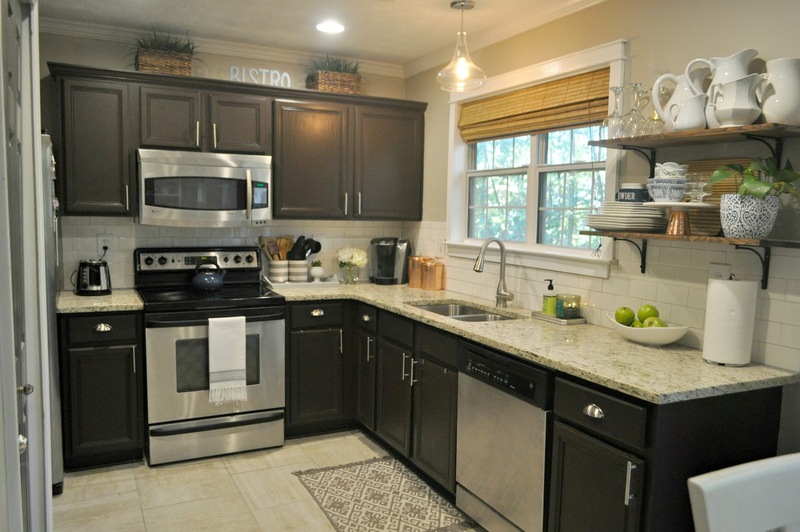 So many beautiful changes, I think my fav is the counter top! So very nicely done my friend! Erin, your kitchen is is beautiful. 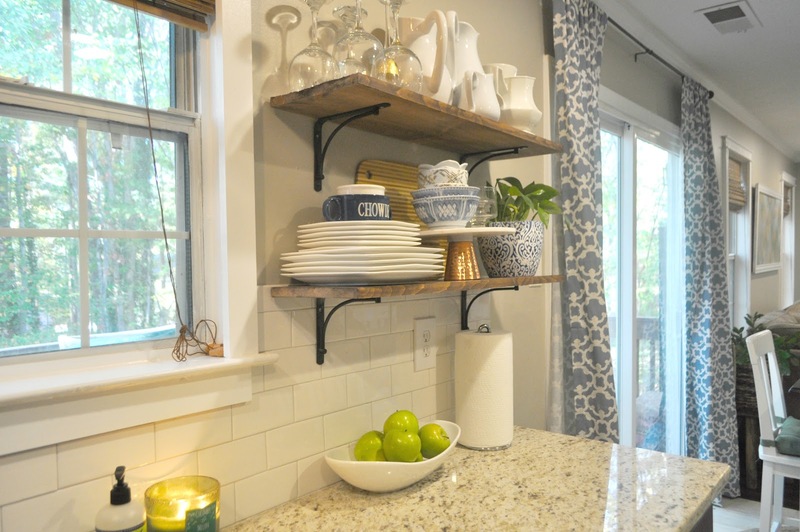 I love how you incorporated a chic yet farm house vibe with the open shelving. So inviting just in time for the holidays! Thank you Marsha. That's exactly what I was trying to do. Thanks for stopping by! 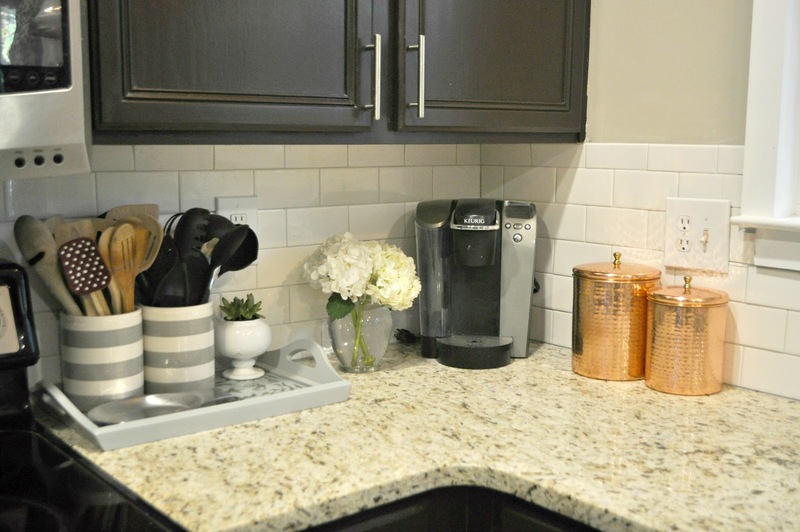 Your kitchen makeover turned out so good, I really like the flooring your chose and your counters + back splash! Your kitchen totally feels inviting. Thank you Katrina! I appreciate your kind words. I definitely wanted it to feel it inviting. 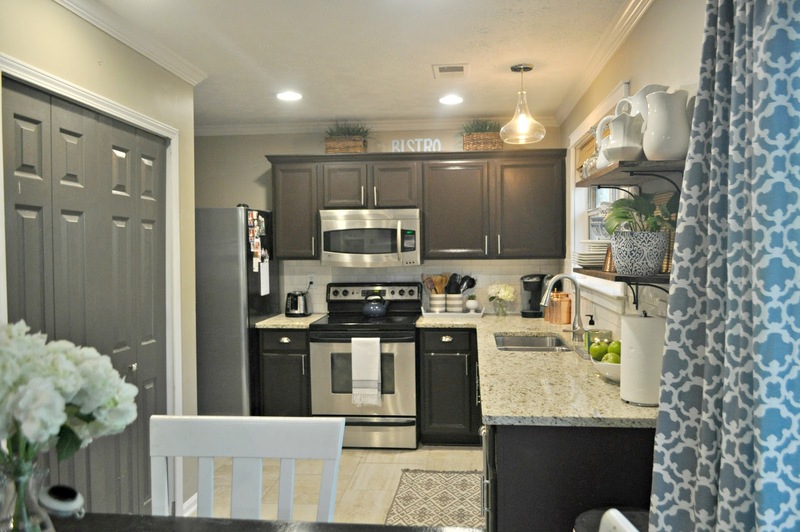 Your kitchen looks amazing, Erin! I love it all. 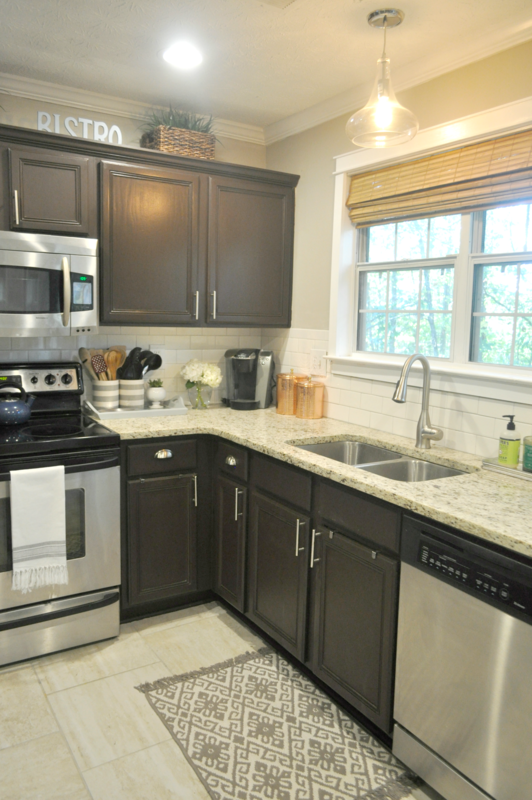 The cabinets color, the countertops, the floating shelves, and the backsplash. It's all so good!